New Delhi: The WCL #T20 Inter-College Talent Hunt Tournament organized by India’s First Women Cricket League (WCL) to scout the hidden talent to provide exposure and platform to promote Women Cricket in India commenced today to an enthusiastic inaugural start. The WCL #T20 Inter-College Talent Hunt Tournament was inaugurated by Captains of Six Women’s cricket teams today. The logos, jerseys, trophy of WCL #T20 Inter-College Talent Hunt Tournament were showcased during the inaugural ceremony at Gargi college today in the presence of all the Six participating teams, Coaches, Umpires, eminent Sports Personalities and the cheering audience. 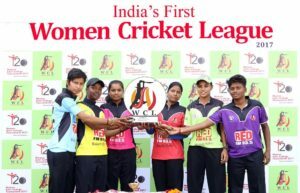 The enthralled Mr. Parul Jain, Founder, Women Cricket League said “We are more than overwhelmed at the response and the fact that we have been able to put together a brilliant tournament within hours of launching Women Cricket League (WCL). We look forward to provide women cricket & women cricketers in India equal opportunities and acknowledgement at par with the men’s cricket/cricketers. WCL #T20 Inter-College Talent Hunt Tournament will be played among six brilliant women teams from Gargi college, Lakshmibai college, Bharti College, KLM Dayanand college, Jesus & Mary college (JMC) and Kamla Nehru College (KNC) of Delhi University. The inaugural match will be played today between Gargi College & Lakshmibai College at the Gargi College cricket ground. The second match between The Jesus & Mary college (JMC) and Kamla Nehru College (KNC) will be played on 15th March at Lakshmibai college cricket ground. The third match between Lakshmibai college and Bharti college will be played on 16th March at Lakshmibai College cricket ground. The fourth match between KLM Dayanand and Jesus & Mary college (JMC) will be played on 17th March at Lakshmibai College cricket ground. The fifth match between Gargi college and Bharti college will be played on 20th March at Gargi college cricket ground. The Semi-Finals will be held at Gargi college cricket ground and the Final will be played at Roshanara Club.